A number of Aces headed to Southern California in July for the 2010 Kobe Bryant Basketball Academy. Head Coach Gregg Downer was joined by assistants Doug Young and Will Carter and alumni Sara Lowe ’01 (the Aces’ all-time leading female scorer and four-year Florida star), Dan Capkin ‘05, Steve Meehan ‘08, and Harley Williamson ’09. Several campers from the Lower Merion area also attended, including Justin McFadden (an incoming LM 9th grader) and Welsh Valley eighth graders Corey Sherman and Shedrick Brown. Kobe Bryant ’96 attended camp each day to welcome campers and parents and teach some of his favorite skills. He signed autographs and took photos with every camper. The five-day camp was held at The University of California - Santa Barbara; a beautiful campus overlooking the Pacific Ocean two hours northwest of Los Angeles. More than 700 campers attended, arriving from as far away as Beijing and Brazil. Kobe Academy was a great learning experience for all of the campers. Each day featured game play, skill sessions, on-court demonstrations and evening activities. For his all-camp presentation, Coach Downer shared some of his favorite shooting drills and talked about the importance of scholarship, citizenship, character and hard work. He also served as commissioner of the 14-15 year old (ABA) division. Coach Young demonstrated the art of “taking a charge” and hosted a Q & A with Coach Downer who answered questions about coaching Kobe during his high school days. Young served as commissioner of the 11-12 year old (NBDL) division. The Aces alumni helped out during the demonstrations and served as coaches in various divisions during the week. 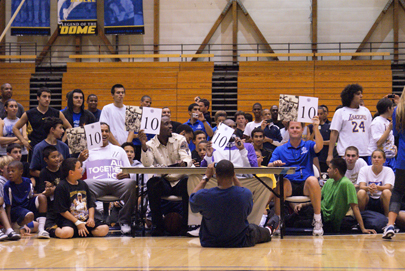 Highlighting the week was the dunk contest in which Coach Downer joined Kobe, Steelers Pro-Bowler Troy Polamalu and LA Clippers guard Ricky Davis as celebrity judges. Pepperdine’s Keion Bell won the contest by dunking over three people.